UC San Diego students and researchers have produced the world’s first algae-based, renewable flip flops. The first prototypes of their new invention, developed over the summer in a York Hall chemistry laboratory, consist of a flexible, spongy slipper adorned with a Triton logo and a simple strap—fairly basic, as flip flops go. But when they go into full production later this academic year at what researchers hope will be a projected cost of $3 a pair, the impact of this campus innovation could be revolutionary, changing the world for the better environmentally. That’s because 3 billion petroleum-based flip flops are produced worldwide each year, eventually ending up as non-biodegradable trash in landfills, rivers and oceans around the globe. Mayfield and Pomeroy, along with their undergraduate and graduate students, teamed up two years ago to develop the world’s first algae-based surfboard. The UC San Diego scientists worked with a local surfboard blank manufacturer, Arctic Foam of Oceanside, to figure out how to make from algae oil the hard, polyurethane foam core of a surfboard, which is typically constructed from petroleum. That development, which was quickly embraced by a surfing industry looking for ways to produce more sustainable and environmentally friendly products, got the two UC San Diego professors thinking about their next step. If this could be done for some of the 500,000 surfboards annually sold around the world, why not for the 3 billion flip flops and millions of other new shoes that each year clutter our landfills and oceans? 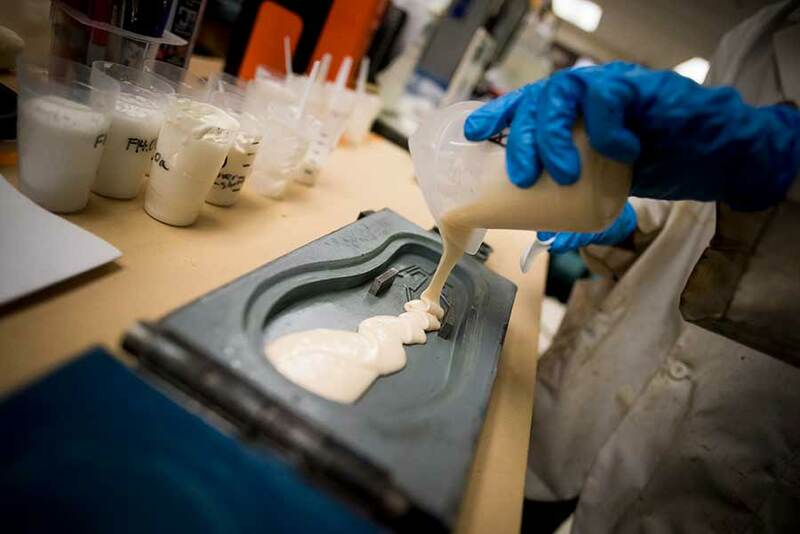 UC San Diego students pour polyurethane into the flip flop mold. “In the laboratory, students are far more engaged when they’re actually trying to solve a problem,” says Skip Pomeroy. To demonstrate the feasibility of their campus-based innovation, Triton Soles, Mayfield and Pomeroy applied for and were awarded last April a $50,000 proof-of-concept grant from the campus Office of Research Affairs. Theirs was one of eight grant awards made in the first year of the Accelerating Innovations to Market program, initiated by UC San Diego’s Office of Innovation and Commercialization, a part of the Office of Research Affairs, and paid for with the help of local elected officials through State Assembly Bill 2664. The goal of the bill is to bring more laboratory inventions from the campus to commercial development. 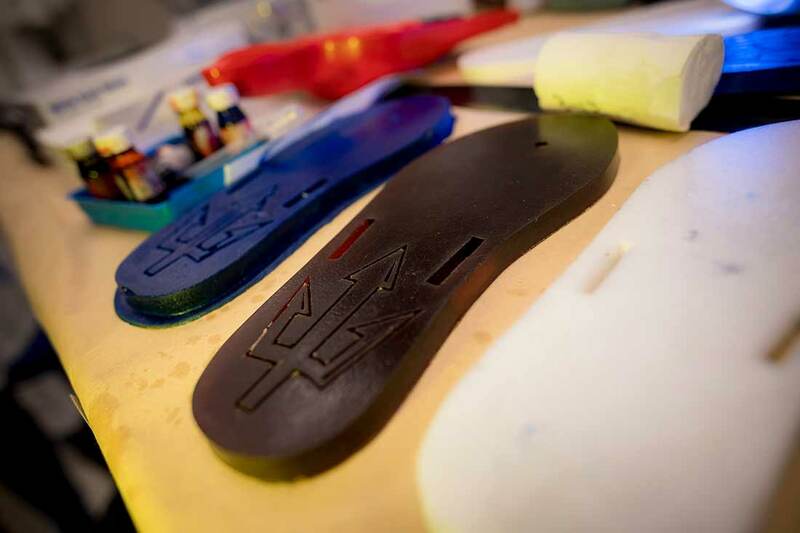 As the first product for Algenesis, the Triton flip flop will allow the three faculty members and students to fine tune the chemistry and manufacturing process for their future shoe soles, car seats and other products traditionally made from petroleum. The Triton flip flops, shoe soles and other polyurethane products the scientists make from living algae oil are “sustainable” because the carbon to construct them was pulled from the atmosphere, rather than underground oil reserves. And the scientists are seeking to also make them “biodegradable,” by chemically converting the algae oil into polyurethane in manner that will allow the carbon bonds to be degraded by microorganisms. 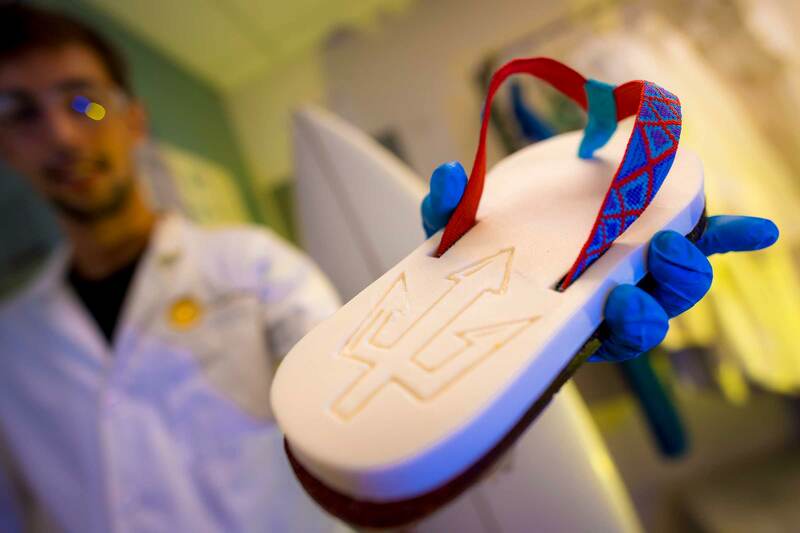 These renewable flip flops, now produced in an array of colors, are allowing the UC San Diego team to fine tune the chemistry for future shoe soles, car seats and other products traditionally made from petroleum. “The idea we’re pursuing is to make these flip flops in a way that they can be thrown into a compost pile and they will be eaten by microorganisms,” says Mayfield. As a longtime surfer immersed in the ocean environment, Mayfield says that using the expertise he developed over decades studying algae and applying it to develop sustainable and environmentally friendly surfboards, flip flops and other beach products was important to him. The algae surfboard developed two years ago by students and faculty is now being used by a number of professional surfers and has spawned a new industry. And with the help of a shoe factory in Leon, Mexico, the current plan is to do the same. 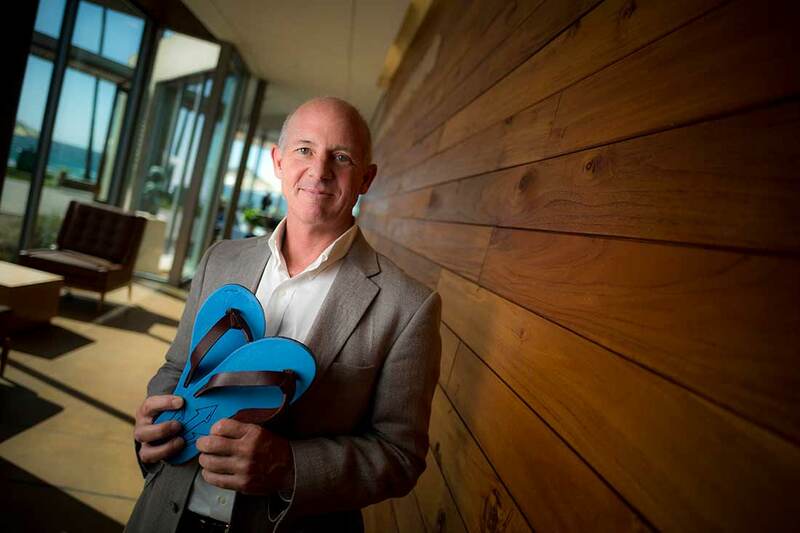 The first step, however, will be the production of a few thousand pairs of Triton flip flops as a test, which will be provided to UC San Diego alumni and given out for special events.